Following World War II, the years of 1948-1949 left a blockade in Soviet controlled Germany, leading many facing starvation in an already war-torn land. Aircraft from the United States and the United Kingdom joined forces in the Berlin Airlift, sending lifesaving supplies into the blocked off areas. At its peak, the airlift saw one aircraft land every 45 seconds! 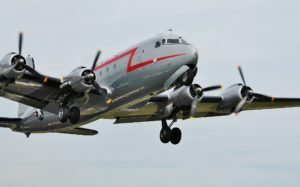 One organization is devoted to remembering the works of the Berlin Airlift pilots and their aircraft: The Berlin Airlift Historical Foundation. Founded in 1988, the foundation currently is home to a Douglas C-54E named the “Spirit of Freedom” and a Boeing C-97 the “Angel of Deliverance”. The Spirit of Freedom has been outfitted as a museum complete with displays full of newspaper articles, artifacts and knowledgeable guides on the airlift. This flying museum brings the history of the airlift to airports around the country thanks to the foundation’s National Support group. With the help from generous donations, the C-97 has also returned to the skies in 2017 as one of only two airworthy C-97s in the world. Funding is still needed to complete the Angel of Deliverance’s purpose as a flying museum. It will document the Cold War starting with the Berlin Airlift through the fall of the Berlin Wall. The agents and pilots at Aviation Insurance Resources (AIR) recently had the honor of touring the Spirit of Freedom at the Wings and Wheels Expo in Hagerstown, MD. They are proud supporters and the trusted insurance agent of the Berlin Airlift Historical Foundation. The expertise of the agents at AIR ensure that these unique aircraft are properly protected while educating the county on such a momentous endeavor. You can trust AIR to protect and appreciate your historical aircraft or museum. To obtain an insurance quote call 877-247-7767 or request a quote online today! To support the Berlin Airlift Historical Foundation call 732-818-0034 or visit spiritoffreedom.org.